Where are the Table Tools? You may want to change the design of an Excel table or PivotTable, or refresh their data, or set some options for them. You've read a help topic that mentions a command on the Table Tools or the PivotTable Tools, but you don't see these tools. Click any cell in the table or PivotTable. If you've selected an Excel table, you'll see the Table Tools with a Design tab. If you've selected a PivotTable, you'll see the PivotTable Tools with an Analyze and a Design tab. 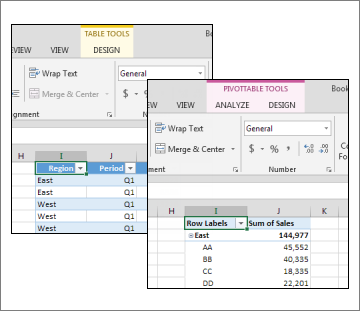 The Table Tools aren’t available on the ribbon in Excel Online, so you won’t be able to use them to make design changes to your table. Refresh data connections : Click any cell in the table > Data and pick either Refresh Selected Connection or Refresh All Connections. Toggle total and header rows : Click any cell in the table > Format as table and choose one of the toggle options.